SimplyFile user interface is represented as an Outlook toolbar or a Ribbon Tab. It is optimized for fast access. SimplyFile User Interface is displayed on the Home tab of the Ribbon in Outlook 2010 or newer. In order to save space, not all SimplyFile functions and buttons are visible by default. Use the Toolbar tab of the Options window to configure which buttons are shown. For even quicker access to the SimplyFile functionality, you can configure hotkeys for its most frequently used commands. Hotkeys will allow you to work even faster without taking your hands off the keyboard. See Hotkeys tab of the Options window. SimplyFile User Interface is displayed as a separate toolbar in the main Outlook window in Outlook 2007 or older. The left-most button, available on the Outlook Ribbon. It displays the most relevant folder for the currently selected message. Click this button to file the selected message(s) to this folder. 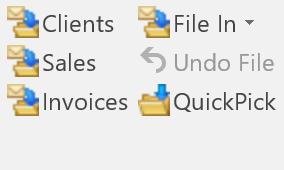 In the screenshots here, “Clients”, “Sales” and “Invoices” are names of Outlook folders. Due to SimplyFile’s advanced folder prediction algorithm, the vast majority of your messages will be filed with one click. The button label displays folder’s short name. The full folder path is shown in the tooltip, when you mouse over the button. If you press the Shift key while clicking the File Message button, SimplyFile will automatically switch Outlook to the destination folder after filing a message. If you press the Ctrl key while clicking the File Message button, SimplyFile will copy the message to the destination folder rather than move it. Both of these shortcuts apply to all buttons that file messages. The File In drop-down will display the next several suggested folders in the order of relevancy. If the One-Click-File button is not showing the right folder (very rare case), you can click one of the folders listed here to file the message(s). This drop-down (Outlook 2007 or older) displays suggested folders for the currently selected message(s). To file into the top-most folder, click the File Message Button. To file in another folder, simply select that folder from the drop-down list. Click this button, located immediately to the right of the Suggested Folder Drop Down (Outlook 2007 or older), to file the currently selected message(s) to the folder listed at the top of the Suggested Folder Drop Down in one click. Mouse over the button and the tooltip will display you the name of the folder where the last message was filed. Click the button, to “un-file” - move the message back. You can click multiple times to “un-file” several messages in a row. If you filed several messages in one operation (by selecting multiple messages or by using File Thread, File Sender, Batch File, etc. ), one click on Undo File will “un-file” them all. Opens the Quick Pick Window. QuickPick is one of the most powerful SimplyFile features. Take a few minutes to get to know it. Batch File Window is another powerful feature you will want to learn about. 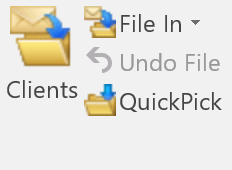 Allows you to quickly navigate to an Outlook folder by typing a few characters of the folder name, using the Quick Pick Window. Starting with version 4, the “Go To Folder” commands lists recently used folders at the top. If the QuickPick window is opened using any other command, the top folders will be based on suggestions for the currently selected message. This button will file all messages from the current folder which have the same subject as one of the messages you have highlighted. Great timesaver! This button will file all messages from the current folder which were sent by the same senders as the messages you have highlighted. Great timesaver! Opens the Batch File Window. This command can file multiple messages into their corresponding folders. After you have trained SimplyFile, try this function. It is quite addictive. Use this button to create an Outlook Task from the currently selected message. The task will be populated with the message subject and body. You can use this option on the Actions Tab of the Options window to control whether the original message is attached to the task. Configure a reminder on the new task, so Outlook notifies you when it is time to work on it. After that you can file the original message out of the Inbox to keep the Inbox small. Using Tasks with reminders is a great way to manage future TODOs and follow-ups without cluttering your Inbox. Does a message require a follow up meeting? Use this button to create an Outlook Appointment or Meeting from the currently selected message. The Calendar Item will be populated with the message subject and body. You can use this option on the Actions Tab of the Options window to control whether the original message is attached. SimplyFile even has an option to automatically invite message recipients to the newly scheduled meeting. After you create the Appointment or Meeting you can file the original message out of the Inbox to keep the Inbox small. Opens the Snooze Window which you can use to temporarily hide a message from the Inbox, then have it re-appear at the time you specify. SnoozeIt is an alternative to TaskIt for managing future TODOs and follow-ups without cluttering your Inbox. We also offer a standalone SnoozeIt product, which offers more features related to snoozing Outlook email. Converts HTML messages to plain text. Why would you want to do that? To protect your privacy and to save space in the mailbox. You have all seen messages like this - there are just a few lines of relevant text, but the message size is tens of kilobytes. The large size is due to images embedded in the message body or the signature. You want to keep this message, but 50 KB is such a waste for something like that. All those messages add up and take up valuable space in your mailbox. Html2Text to the rescue! With one click you can reduce that message to the 2-5KB size it deserves, by eliminating the unneeded images and HTML markup. By default SimplyFile saves a copy of the original message in the Deleted Items folder, so you can always recover it if you need it. You can control this behavior using Make Backup Of Converted Messages In Deleted Items. Allows you to quickly perform an Outlook search for messages related to the selected message. You can search for messages with the same tags, sender, recipient or subject. It is a great way to quickly lookup messages related to the one you are working with. The counter next to the smiley indicates the number of messages accumulated in your Inbox since you have opened Outlook. The counter keeps changing as you file and receive messages. When you file a message, the count goes up, when you receive a message, the count goes down. A positive number indicates that you have fewer messages in your Inbox, which is good - hence the smiley. A negative number means you have more messages in the Inbox - hence the frown. Mouse-over the button to see additional details. The intent is to provide you with a visual indication of how you are managing your email flow throughout the day. Many customers told us that this helps motivate them to manage the Inbox better. The SimplyFile Drop Down Menu is the last command on the SimplyFile Ribbon or Toolbar. It is labeled More in Outlook 2010 or newer and SimplyFile in Outlook 2007 or older. Click on that menu to see additional SimplyFile commands. All commands listed below are located there. Use this menu to access the commands which you might have hidden from the toolbar to save space. Opens the Train SimplyFile Window, which you can use to quickly bring SimplyFile up to speed on your Outlook folder hierarchy. Opens the Folder Options Window. We hope that you love using SimplyFile. So much so that you would like to share its benefits with a friend. Use this command to compose a note about SimplyFile to your friend. Rest assured - the email will not be sent without your approval! We would love to hear what you think about SimplyFile. Send us a note, we are looking forward to hearing from you! Check to see if a newer version of SimplyFile is available. Opens the SimplyFile About Window, where you can see SimplyFile version and your license information. After you have purchased a license, use this command to enter your license key into the product. Use this command to purchase a license key after you have taken the evaluation version for a spin and liked what you saw.